The children of Holbeton pre-school beach school are in for a treat in January. Instead of walking down the narrow path to Mothecombe beach, they will be scampering through the orchard and woodland gardens at Mothecombe House, exploring the tree house, and fairy tree on the way. When I realised how difficult the public path to the beach was becoming for mums with pushchairs to use, I decided to intervene. The Flete Estate will be carrying out improvements to the public path through the winter, and in the meantime the Holbeton pre-school children and mums are welcome to walk through the garden to Beach School. I have also invited them to use the little teahouse on the beach as a place to warm the children and give them their hot chocolate in front of the fire. 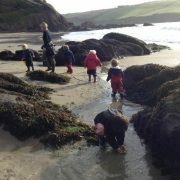 I am very keen to promote Holbeton pre-school and primary school’s access to both Beach School and Forest School on the Flete Estate as I am so impressed by the value of outdoor learning for children. It’s easy to take our wonderful surroundings for granted, but only a tiny number of schools have the regular access to Forest and beach schools that Holbeton children enjoy. 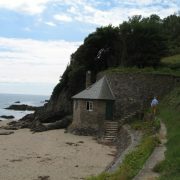 The little beach teahouse was originally a lime kiln, built for burning limestone which was brought in by boat. The resulting powdered lime was added to the fields to balance the acidity of the soil and improve the growth of grass and crops. In the 1870’s Henry Mildmay added the little building with windows, and two fireplaces to make two separate changing rooms for the ladies and gentlemen when they came to bathe in the salt water. He built in a seawater swimming pool, the remains of which are visible as broken walls beyond the teahouse, reputedly blown up by the Home Guard at the end of the war.